The idea that the bond market is a bubble about to pop is a subject not to take lightly. This matter has been scrutinized many times in recent years and little has really changed except debt has grown much faster than the economy in general. Still, we hear many predictions of interest rates remaining low forever and a day as it appears the whole world is trapped in an easy money low-interest rate environment with no way out. This is a sign that in the future a massive problem is developing which holds a great deal of risk. 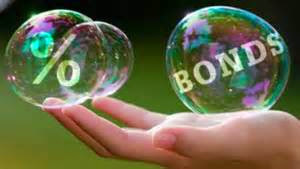 To those of us who think the bond market is a bubble and when it pops it will leave a massive path of destruction in its wake it is clear the general public is totally unaware of the ramifications such an event. These even extend down to reduced payouts on pensions. A lot of money has rushed into government bonds in a flight to safety, and this has sent yields lower and lower. This is again part of the conundrum created by too much freshly printed money floating around and people needing someplace to stash it. Investors look for large markets to park their money because it implies a degree of liquidity that insures a quick exit if necessary. More attention should be focused on what happens if a popping of the bond market bubble occurs. The idea of money quickly leaving the bond market should be a big concern to all governments and central banks. Bonds are not just issued by America but by countries and companies all around the world. While some forecasters predict America is now set to grow at the fastest pace in a decade debt investors are signaling their skepticism as problems in Europe and talk of trade wars threaten the U.S. recovery. Investors’ expectations for consumer-price increases have diminished as the Federal Reserve debated how soon to raise its benchmark interest rate which has been held close to zero in an effort to support demand in the economy. It is hard to know if this is an indicator the marketplace feels comfortable that inflation is going to remain tepid or if concern for safety is driving this market, but I contend it is the later coupled with an influx of foreign capital and a strong dollar. If we consider the possibility that inflation has been kept in check primarily because we as a society have invested a large percentage of our wealth into intangible products or goods such as stocks, bonds, and even currencies a new danger emerges. If faith drops in intangible "promises" and money would suddenly flow into tangible goods seeking a safe haven inflation would soar driving interest rates upward. Like many of those who study the economy I worry about the massive number of promised being made and the debt being accumulated by governments, this all ties into the pace at which central banks have expanded the money supply. Interest Rates Could Soar Again! The timetable on which economic events unfold is often quite uneven and this supports the possibility of such an inflation scenario. The current subsidizing of the auto, housing, and financial industry with an ad hoc disregard for basic economics produces a very flawed kind of growth. For years the ECB has manipulated bond rates lower for countries undeserving of such, as a result, Italy, and others have kept their debt service cost in check, but the fact is artificial rates from central banks mask and perpetuate a debt problem that will come back to haunt them. Bond buyers should never forget how in 1980 the Fed turned bonds on their ear by rapidly jacking interest rates to 20% to stop inflation. That acted as a reset for the economy that had broad ramifications. If this were to happen again such an event would not only affect bondholders but would test the economic foundations of both the country and the world. The idea that markets are always efficient is a myth manufactured by so-called experts such as Paul Krugman in the ivory towers of academia. In many ways, they pose one of the greatest threats to the stability of our economic system. Disconnected from the real world those responsible for guiding our banking institutions often fail to see potential second and third order effects of debt monetization. A policy of blindly trusting anyone who claims to be an expert has disaster written all over it. If the bond market is indeed a bubble the implications of its collapse will be massive. Not only will bondholders be stripped of wealth but soaring interest rates will magnify the nations debt service and rapidly impact our deficit in a negative way. It should never be forgotten that debts can go unpaid and promises are often left unfilled, the general impression that many people hold that things are different this time will surely be tested. Footnote;. As usual please feel free to explore the blog archives and as always your comments are encouraged. The two posts below are related to this article.